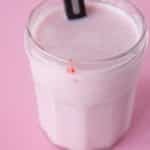 Natural homemade recipe for Nesquik Strawberry Milk using fresh strawberries. This milk is easy to make, and much more healthy than the store bought version! Also includes vegan strawberry milk option. As a kid I loved strawberry milk. 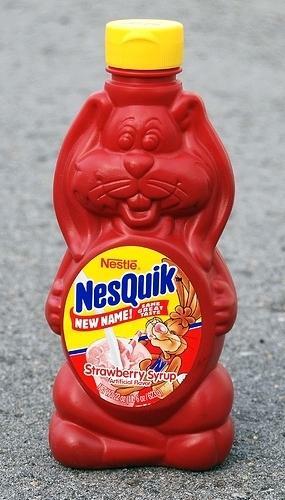 Do you guys remember when Nesquik syrup used to come in bunny shaped bottles? I used to feel so bad for throwing them out that I would keep them all. Eventually the cabinet under out sink became so packed with bottles they would spill out whenever the door was opened! 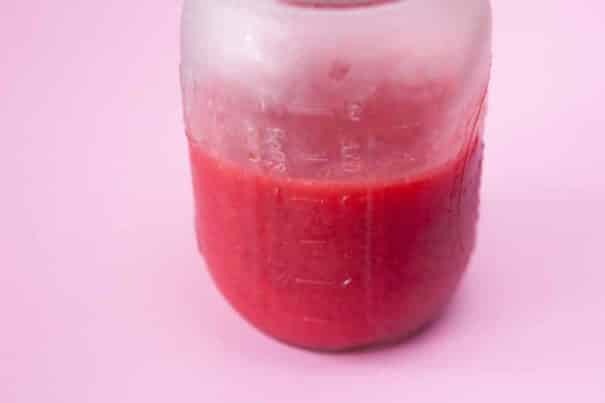 Lately I’ve had a craving for Nesquik Strawberry Milk but being a little older and more health conscious, I wanted to make my own with simple ingredients that I felt good about, including feeling good about serving to my own daughter. And how do we make a healthy strawberry milk? We use fresh strawberries for the main ingredient! This recipe is going to make about 6 ounces of strawberry milk syrup, which will make 4 servings. You can keep this syrup in your refrigerator for 1-2 weeks. First you’ll boil the strawberries, sugar and water in a saucepan, simmering it for about 10 minutes. Then transfer it to a blender and blend until smooth. Alternatively you could use a immersion blender (I love this tool, especially for cauliflower soup!). Either way, the boiled mixture will be hot, so please be careful. After that you’re ready to use your strawberry syrup to make strawberry milk! Add about 3-4 tablespoons into a cup of milk and stir. And just like that you have homemade strawberry milk! 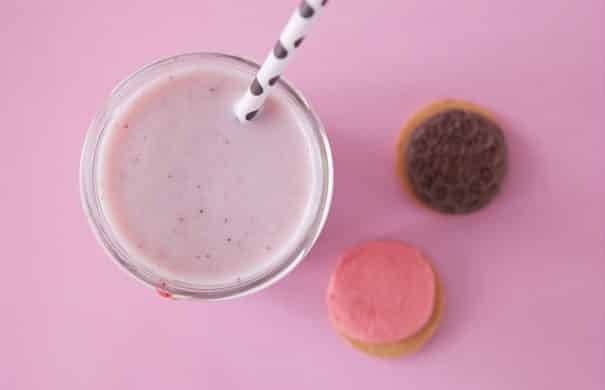 If you want to turn this recipe into Vegan Strawberry Milk, that’s easy. All you need to do is replace the milk with almond milk – I prefer Unsweetened Vanilla almond milk. 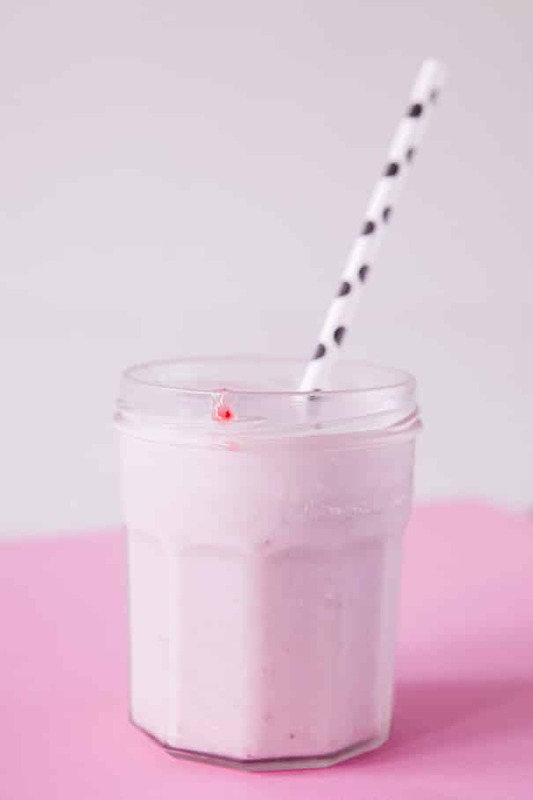 I hope you enjoy this simple Strawberry Milk recipe! Put strawberries, sugar and water in a saucepan bringing to a boil over medium heat. Transfer strawberry mixture to blender, blend until smooth. Put in jar, refrigerate until chilled. To make strawberry bunny milk, add 3-4 tablespoons of strawberry syrup to 1 cup of milk. Stir. This makes 6 ounces of strawberry syrup, good for about 4 servings. The syrup can be stored in your refrigerator for 1-2 weeks. Aw!! hah that’s too adorable!! Oh man. It’s probably bad that you discovered this. Because now, I’m absolutely going to become re-addicted! I love strawberry milk! Pink milk sounds extra fun Kelly! I haven’t had strawberry milk in FOREVER because of the terrible nutritional stats on the bottle. But homemade HAS to be better for you. It just has to. Ok I am so happy I am not the only one who drinks this stuff! We have it in my house for when my niece and nephew visit but I am definitely known to drink it in between visits. I am SO making this for them! I was more of a Yoo-hoo girl and a chocolate Nesquick, but I am quite familiar with the yellow containers. I would BEG my mom to buy those every week!! Fresh strawberries and milk and sugar – can’t beat that combo! Yoo-hoo knocks my socks off too! They are. We have your plastic bunny bottles. If you ever want to see them again, send several ooey, gooey cheesy casseroles to my house. Hahahaha, you made my day. <3 Thanks Francine! PS. Sending casseroles to your house. I bet this is wayyy better than nesquick! I’m more of a chocolate milk kind of girl myself, strawberry bunny milk is mighty cute though. Who could resist strawberry bunny milk?! I love this – pure fun and pleasure!! Enjoy the milk and the cookie! Why purchase the box mix when you can have it fresh. This looks sooooo good. My daughter would go bananas over this. Thanks for sharing. Hope you both enjoy Vicki! So cute…do you know that I have never had strawberry milk? I can’t even say that I’ve ever had a strawberry milkshake. After seeing this, I’m sitting here wondering why not? And I need to take care of that immediately!! I think I’ve spent a lifetime revolved around chocolate, and it’s time for a change!! A strawberry revolution of sorts? Maybe… 🙂 Thanks for sharing.. this is awesome. 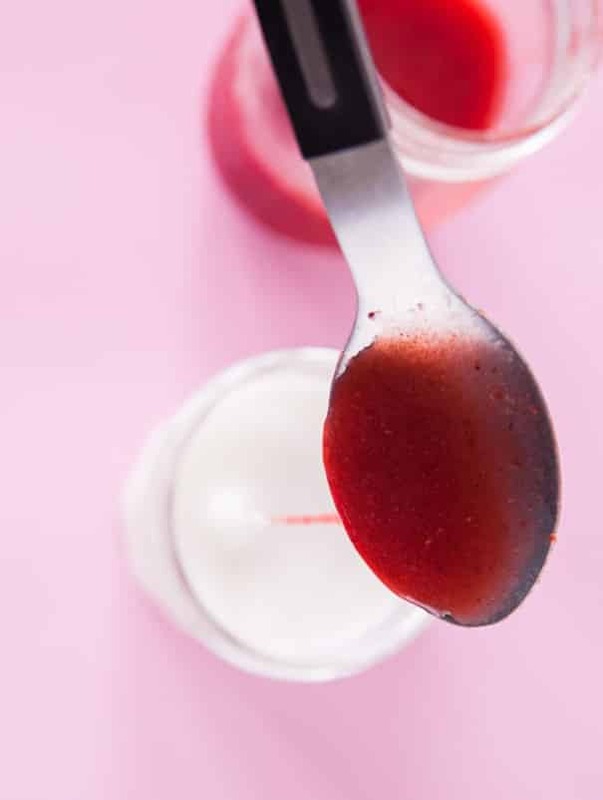 And I want to take a spoonful of that strawberry sauce and just eat it. Ok, maybe more than one spoonful… <3 I hope your day is beautiful..
A strawberry revolution, I love the sound of that! Let me know if you try it! Enjoy! 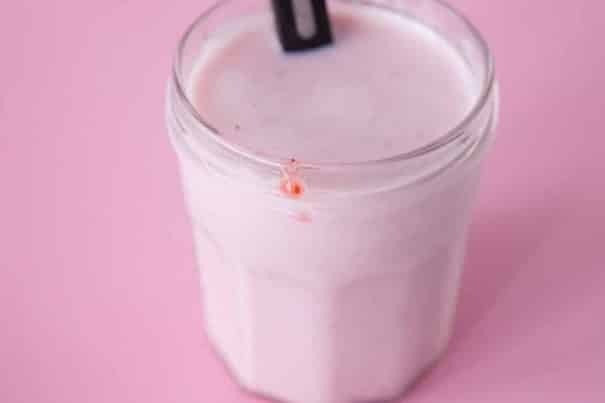 I’ve made homemade strawberry milk for my kids and they LOVED it. It’s so much better than the store bought brand. I adoooooore that this is made with real strawberries–the best! I used to love Nestle strawberry syrup too! My mom used to make me strawberry milk when I was little, but I think it didn’t happen very often. I love that you made a natural version, and I bet it’s even tastier than the bunny one you remember. Also, I’m totally making a milk carton rabbit. I want to see your milk carton rabbit Amy! I always loveddd strawberry milk as a kid. This sounds perfect – I love that I know exactly what is going in it and that it’s made with real strawberries! Happening at our house soon! This is so awesome, Pamela! One, I love the story behind it, and two, its super easy and cute! I’ve never had bunny milk, but (if only for the color!) I want to try some asap! I was obsessed with nesquik when I was younger I can’t wait to try this recipe! What a neat idea! I LOVE “cute” foods! They’re just so much more fun! Wow – I haven’t had strawberry milk since I was a kid! This definitely takes me back and it looks really, really good. No crap or chemicals or dye in there. It’s definitely one of my favorite colors! I never liked chocolate milk, but love strawberry milk! This sounds so good! Hehe, that bunny carton is too cute! I always loved strawberry milk growing up too so this sounds incredible! Love that you made a much healthier version – need to make this soon for my son as I’m sure he’ll love it just as much as I did growing up 🙂 Thanks for sharing Pamela – pinning! I have never considered making my own strawberry syrup before. I love a good glass of strawberry milk, but reserve it for a guilty pleasure or when I’m *cough* hungover *cough! * I look forward to making this at home in the bright light of day! When you make it yourself, it’s healthy, right!?!? Enjoy it Tracy, hope it brightens up your day! Nesquik!! Brought back so many wonderful childhood memories!! 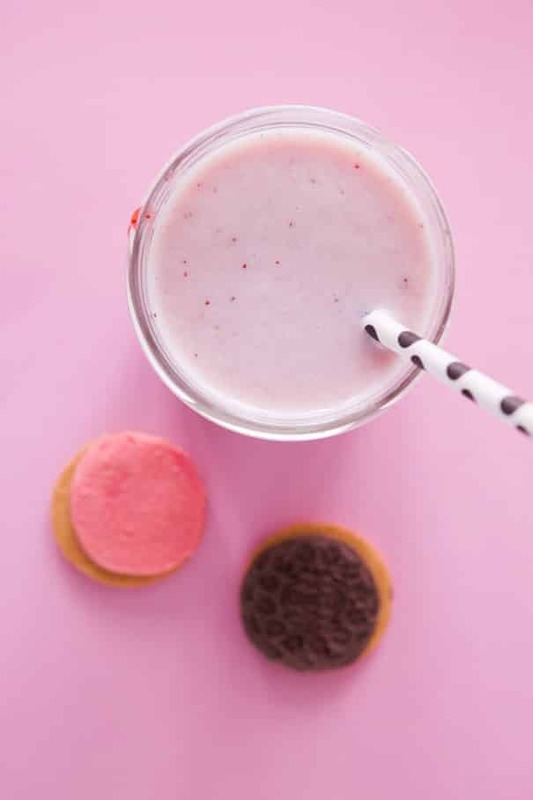 But your version of strawberry milk looks more delish! Oh my – I used to love Nesquik strawberry milk! But, I think I love your healthy strawberry milk more! That bunny is huggable. I know I’ll love this along with my boys, cause I do make something like this but with honey or maple syrup. I know sugar is way more yummier though. My teen hates hates to eat fruits, but loves in smoothies and drinks like this. Hope the whole family enjoys Ash! Love the DIY carton bunnies & the jar! Enjoy Ruby! Hope you love it just as much now! Im in love with this milk, hope you and the boys enjoy this! OMG. 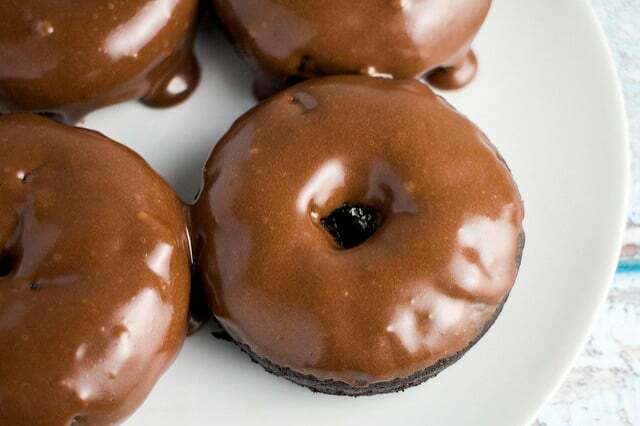 My mouth is watering just looking at your pictures. My nine year old LOVES strawberry milk – he would love this!! Thanks for sharing on Saturday Night Fever! Pinning this now! See you again this week! Hope your son loves this recipe – enjoy! I used to love this milk!! My mum always used to buy the chocolate flavoured one and I can vividly remember eating it by the spoonful. I haven’t had it in years, I’m so glad other people still crave this stuff when they’re no longer a kid! haha. Funny – we also called it Bunny Milk (only the strawberry Quik). My son came home from day care asking me to make “bunny milk” – I had to ask the day care lady what that was! He turns 21 in Sept. and I’m throwing him a bday party themed with all his childhood favorites made into foods. I happened on your post while searching for Strawberry Quick recipes! Just had to let you know that here in MI others called it ‘Bunny Milk’ as well (at least 8 kids who are all in their 20’s now and their parents 🙂 !! That’s so funny Carol! I’m glad to know others call it Bunny Milk too! Have a great birthday party, I love the idea of having all his childhood favorites! I know just the little girl who would love this and I am sure even with the sugar it is much better for you than it’s cousin in the cute bunny bottle. Thank you for the recipe and entertain post as well. This is so awesome, Pamela! One, I love the story behind it, and two, its super easy and cute! I’ve never had bunny milk, but (if only for the color!) I want to try some …..
I’m so happy to hear this Rachel, thanks for commenting and letting me know! I loved strawberry milk as a kid but it was always the “powdered” stuff. This looks tasty! Kids will start loving milk if milk would be this much delicious. Your blog is really awesome and helpful.